The soldiers mocked Jesus, by stripping off his clothes and putting a scarlet robe on Him. They made a crown of thorns and made Jesus wore it on his head. They also put a reed in Jesus’ right hand. Then the soldiers spat saliva on Jesus and took off the scarlet robe they put on Him. After that, the soldiers took Jesus to the Place of Skull called Golgotha so that they can crucify Him. Along the way, a man named Simon appeared. So they made Simon carry the cross on which Jesus will be crucified. When they reached the Place of Skull called Golgotha, they gave Jesus some sour wine to drink. After that, they nailed Jesus to the cross. They took away Jesus’ garments and divided His garments and then they cast lots among themselves. 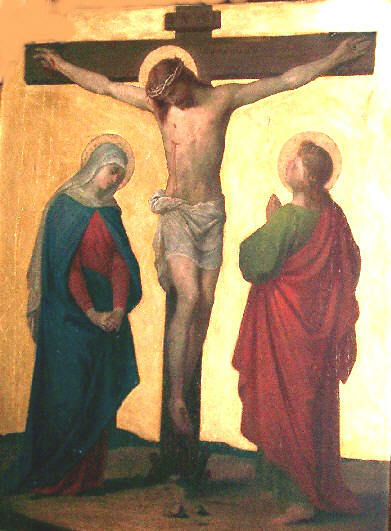 There was a description on top of the cross which Jesus was crucified which is: KING OF THE JEWS. Besides Jesus, two robbers were also crucified along with Jesus. A soldier ran and filled a sponge with vinegar and let Jesus drink it. After Jesus tasted the vinegar, He cried out in a loud voice, saying, “I committed my Spirit into your hand, Father.” Then Jesus died. At the very moment, the curtains of the temple were torn into two. The earth shook violently and the rock split. A man named Joseph from Arimathea went to Pilate and asked him for the body of Jesus. Pilate gave permission and Joseph wrapped Jesus in a linen cloth and laid Him in a tomb that he had hewn out himself.